It was cloudy all day today. No sunshine at all. No rain. And clouds aren’t all bad on a travel day. We might as well get use to the clouds based on the 7-day forecast. 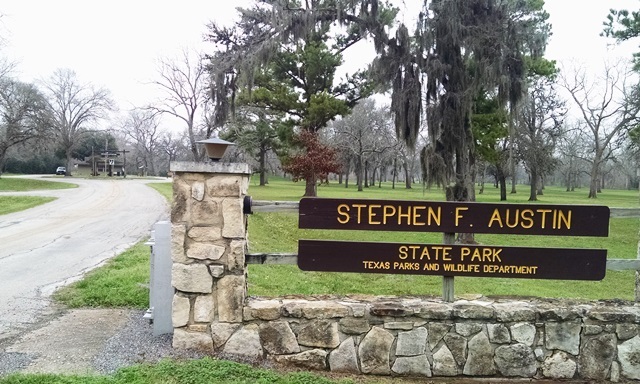 Today we moved from Kerrville-Schreiner Park to Stephen F. Austin State Park in San Felipe, Texas. It is on the west side of Houston about 50 minutes out of Houston. San Felipe is really just a tiny town of 747 people and all that is really here are the historical sites of Stephen Austin, the park and golf course. Dave said something about us being out in the woods and seems he is right. Nearby towns that are larger but still outside of Houston are Sealy, Fulshear, (where Dave and Linda live) and Katy. We are still about an hour from where Anne’s cousin Ross and Barb live. We hope to see them again while we are here too. We had an uneventful travel day and we are settled in. We will see what tomorrow brings.